The large grey continent southwest of the main continent is a horrible wasteland, teeming with monsters and poisonous planets. There are a few semi-civilized settlements on the northern and eastern coastline, but for the most part the continent is devoid of intelligent life. The continent stretches on west and south - for all intents and purposes - endlessly. A friendly but somewhat mysterious culture, the Echarians are the only people known to ply the Northern Seas away from the coast on a regular basis. This is because of a cultural affinity for beasts of all kinds, allowing them to tame a small number of the sea serpents (or Vermicci), along with many other both mundane and magical beasts. This affinity for difference extends to sentient species to and many races, including humans, elves, dwarves, and goblins call Echaria home. They also tend to have better relations with other nations, trading with most of the Northern nations as well as some along the East and West coasts, although they begin to come into competition with Taridea the further West they travel. It is even rumoured that some adventurous traders have made inroads with the Haldicians or the supposed remaining fairies, although there is no official evidence to support this. The island of Echaria itself is relatively flat and is said to have once been a desolate windswept patch of rock. It’s founding myth states that this changed when members of each of the principle races of the world were called together to convert the island into a liveable form so as to provide a haven for the great dragon Galmio, who was severely wounded in battle with Parikthmel, a draco-liche of immense power. It is sometimes said that Galmio sleeps still beneath Echaria, saving his strength for the time when he must once again rise and face his undying enemy. Regardless of the validity of this story Echaria is now a forested, moderately fertile island, protected by a ridge of sea-cliffs on the eastern (windward) side of the island. Despite this it is still highly reliant on trade and has flourished through its ability to exploit markets that others would find impossible. While not as wealthy as Taridea Echaria has accumulated a not insubstantial measure of wealth through trade which would seem to make it a likely military target, although this has rarely happened for a number of reasons. Firstly, its position in the Northern sea makes it risky for foreign fleets to attack, given the natural deterrents of sea serpents and other dangerous sea beasts. Secondly, through trade Echaria has formed a number of strategic alliances which tend to circumvent the aggressive intentions of other nations. Finally, the high focus on the taming and breeding of magical and quasi-magical creatures has caused rumours to spread which imply that Echaria has significantly greater potential military might than it actually commands and any attacks of this sought would likely demoralise enemy soldiers. Echaria itself is not interested in war either, it’s founding myth predisposing its populace to think of themselves as a sanctuary for those who need protection and thus tend to focus on more peaceful matters. Echaria is ruled by a council, consisting of any citizen of the country in attendance at the time, each with one vote. There are a core of what may be thought of as leaders who spend a majority of their time at the council but, while they are widely respected, there votes are not worth more than any member of the public and thus the skills of oratory and persuasion have become highly cultivated in Echaria. In addition, as all in attendance usually demand to be aware of the facts of a matter before voting government transparency is of an unparalleled level in Echaria. Go make your own thread, whiner. The Great Monster Empire is an empire of sentient monsters located deep in a harsh jungle. No beings from outside this continent have ever been known to venture that far into the jungle and survive, and on the rare occasions when the monsters meet outsiders, the outsiders assume the monsters to be savage beasts due to their appearance, when in fact they are not savage and have build an advanced civilization. Just west of the Great Monster Empire is the often lush, nation of Oeftec, a nation named after their God of the Lake and that is inhabited by smallish, four foot tall humanoid creatures. Due to a lack of rivers and other water sources all Oeftecan settlements are located around a large lake in the middle of the nation, a lake that, for some unknown reason, only exists around 40% of the time. It's not that it dries up but rather the space in which the lake resides just disappears. This unusual phenomenon has the advantage of causing all the settlements to be directly adjacent to each other, a great opportunity for the trading and sharing of materials and ideas, but also causes massive droughts that have been known to last for years. These long droughts cause Oeftecans to value water greatly, and the Oeftecans, when the drought persists for long periods of time, have had to rely on imported water brought by traders. Those traders who are willing to risk trekking through the monster inhabited continent, and can deal with the completely random weather patterns, mostly due to the odd temporal effects described below, can, if they arrive when the lake is missing, often trade a few measly buckets of fresh water for a large amount of the minerals and materials that, while found abundantly in Oeftec, other nations value for their rarity. The monsters, from the Great Monster Empire, who have had a longstanding animosity towards the Oeftecans, because other nation readily accept and help them and their belief that Oeftec is cursed land, refuse to trade with them and, in an attempt to prevent trade with other nations, have been known to attack any traders that they come across. While this does lower the amount of trade the Oeftecans receive it does little to help people's view of them. To confuse matters more, time doesn't pass uniformly within the borders, nor does it have any relation to the time the surrounding areas experience. Some days last less than an hour while others, although this is a rare occurrence, have been known to last for several months. Traders, a rather rare, and always welcome, sight in Oeftec have been known to stay for a few hours, only to find that centuries have passed outside, or to stay for years, to find that it had been mere seconds for their friends and fellow travelers. There are even stories of traders dropping by only to find, when they leave, that they have come out centuries before their nation was even conceived. The nation of Cyrusia is a large land of comprised of both deserts and fertile farmland around its rivers. It's people have a rich an ancient history, beginning with several ancient tribes and finally their unity under a great and glorious King. Though his descendants died out, multiple states have risen and fallen in the land, and now it is ruled by a relatively stable, partially limited hereditary monarchy. The most sacred place in this land is at the Old Capital of Pentadaterrae, where the tomb of the Great Founder and its temple complex is located. Today the center of modern day government and commerce is at the New Capital, Tetrafludopolis, at the spot where three major rivers intersect. Cyrusia today is often divided according to the landmasses separated by the rivers, two major and five minor, five in total. This is the aspect that gave the Great Kingdom it's name, the Pentaterriad Empire. Many ruins can be found around this still moderately decent land from the times of that Golden Age. Edit: Oops. Forgot to edit the big white space out. Goddammit Randall and your word substitutions. I should call my Senator and have him consult the Congressional Leaders. Far up north, where no Taridean trading ship ever explored, lies Hardrådjørd, land of the Frabærar. The Frabærar are descendants of the peoples that live further south on the same continent. Their culture is rough, with no place for the weak, and hard work and military training are central in their culture. Nevertheless, the Frabærar have built a succesful trading empire around the northern part of their continent, making good use of the snøjar. The snøjar are little wool-like creatures that use the sunlight that reflects from the snow as an energy source. They eat snow, and the micro-organisms living in it. When given enough love and attention, by other snøjar but apparently also by the Frabærar, they get excited and produce ice at a rapid speed. The Frabærar use vehicles with a kind of large iceskate beneath them, pulled by a large group of snøjar. The snøjar generate ice fast enough to let the vehicles travel over ice wherever they go, as long as they are treated with love and respect. Using these vehicles for centuries, the land of Hardrådjørd is filled with many ice roads, some of which are claimed to be visible from the moon(s). The combination of a rough people that cooperates intimately with cuddly woolball creatures, makes Hardrådjørd an almost paradoxical land, where strangers can rarely understand what is going on. Nasyuht is a state ruled by currency: Whoever has the most money at the end of each number of years (Or whatever the planet's revolution on this planet will be called) gets to become head of the executives (With a body of representatives from each region) The country is very big on exporting food, with the southern coastal area fishing and whaling and collecting sea sponges, and the east raising and harvesting land-living animals. Farming is mostly even between the two, but it isn't too popular; Nasyuht is a slightly carnivorous society. Its capital, Thunas (Literally short for "Capital of Nasyuht" in the native language), actually is a city that is nearly floating on the northern gulf (Whose name is disputed: Nasyuht would like to call it Gulnasyuht, while the other countries around would much rather it be named after the continent), if it weren't for the plumbing tethering it to the seabed. The State of Kallipolis is a small state bordering the southern ocean. It consists of a main capital city after which the entire state is named as well as a few auxiliary villages, towns and farmlands and forests. Founded on the principles of its ancient and revered chief philosopher, Platates, Kallipolis claims to be a state ruled in perfect harmony and justice. The state is divided into three classes of people; workmen, auxiliary guards and the rulers, a series of Philosopher kings who rotate their rules after extensive education. All citizens are educated to the necessary levels for their class and position. The Kings are said to be the wisest and most naturally talented of the people, chosen from the guards, who are said above all to be morally outstanding than the general populace. This is pretty much a slightly less strict version of Plato's "Republic". Most people are assigned to a single craft to participate in for life. This can only be changed if the ruling council of Philosopher Kings decides it is in the best interest of the state for their profession to be changed. Justice is strict, and those who do not adhere to the strict class and role boundaries are quickly exiled. Although Kallipolis seems to run smoothly, many question it's seemingly boring and strict nature, and some more liberal thinkers wonder if its apparent "soullessness" can stand up to the surrounding world. ...And then It happened. An explosion of unknown origin and immeasurable power levelled the Heart of D'achlis within seconds. Terrifying creatures climbed out from the rubble of the once proud utopia. These "Xcryst", devour any organic material to survive and reproduce, and can 'evolve' itself into many different forms when the need arises. 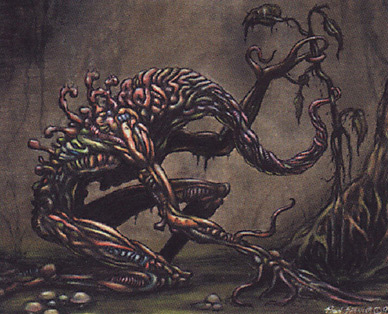 The survivors of that cataclysmic explosion became vulnerable prey as the Xcryst feast upon its hapless victim and quickly multiply, spreading itself like a plague upon the rest of D'achlis' inhabitants. Only the lucky (or unlucky) few escaped. Generations had came to past and now the once wondrous D'achlis was in total ruins. The few band of humans struggle to survive but constantly hiding, savaging what was left of their once proud society, fighting against Xcryst and occasionally each other for valuable resources. Ever so often groups of humans would unite together, settle and secure an area only to be overrun by endless swarms of Xcryst. Xcryst came in all sizes and forms: from as small as a fly to giant mammoths; they could fly or slither underground to catch its prey. The Xcryst themselves, while hunting in swarms, also constantly war and devour each other. They are epitome of "survival of the fitness", competing and assimilating each other to form the ultimate survival machine. There's even rumours of Xcryst in human shape, sneaking into a human settlement claiming refuge only to devour them in their sleep. Even darker whispers emerges of a giant "Mother Xcryst", a Xcryst so huge it towered even the tallest building, constantly devouring smaller Xcryst while giving birth to powerful and numerous new breed of Xcryst. The Republic of Hedgehog (dark green) has a storied history of constitutional representation long marred by warfare and invading forces, eager to take advantage of their weak central government. The invading forces tended to leave after conquering Hedgehog because they realized that there is almost nothing of value in said Republic. It is bordered on three sides by a long river that meets with the sea at both ends, and within are absolutely no natural resources. The inhabitants of the republic, who call themselves 'hedgehoggers,' live in cozy little underground houses and subsist mostly on mushrooms, salt, and rodent meat if they're feeling fancy. A few of these separate underground dwellings have formed into larger, city-like underground networks. Cave-ins are a consistent problem for the hedgehoggers. Above ground, the Republic of Hedgehog is comprised mainly of grass, mud, and gravel. It has no trade, natural resource, military, or cultural value. But the hedgehoggers are happy. The small, coastal Star-King Empire (lavender) has been in a bitter struggle with Taridean trade empire for centuries, a struggle which Taridea has rarely recognized because of their general superiority to the people of the Star-King in every way. In response, a long succession of Star-Kings have managed to colonize a fair amount of distant lands that were too useless for Taridea to bother with. In this endeavor, however, they reached far enough south in their shoddily-constructed boats to being claiming lands in the Wine Islands, which turned out to be surprisingly profitable. The Star-King at the time, completely befuddled as to what to do with actual wealth, completely mismanaged his finances and caused rampant inflation within the empire, causing total economic collapse. Most of the colonies would have broken away from the weak state at this point (and a few did), but the Star-King that succeeded the economically foolish one was especially ruthless, and crushed all resistance with an iron fist before disbanding the military because he couldn't pay for it. There are a few powerful and privately wealthy merchant families within the empire, however, who often work to keep the king weak and keep all of his holdings together in one coherent political unit for their own personal benefit. They're not exactly "running the empire from behind the scenes," but it would probably fall apart fairly quickly if they weren't there, and they will likely be responsible for continued attempts at expansion into profitable lands. In case you forget which countries are which, here's a labelled map. Last edited by patzer on Fri Nov 15, 2013 4:49 am UTC, edited 1 time in total. I vote patzer for president of being awesome. Yeah, Patzer is pretty good at map-keeping. This map looks exciting. I want to go on an adventure to it. While it was known collectively as one region, the land itself is as diverse as the regions that surrounds Centralia. The ‘Glass Peak’ was just one of the minor Peaks of The Sermon Mount as it rises in attitude. Second in height only to Mount Ygasuya in the south (together they form the twin peaks); few have ever reached the tops of The Sermon Mount. Those that survived the ordeal spoke of millions of dead bodies stripped naked on top of the mountain, perfectly preserved in the dry and chilling climate. They could not determined how long the bodies were there for, or even what race those people were. From the few artifacts that was gathered around the bodies, however, scholars could only assess that these people are sufficiently advance in culture and technology. How and why there end up dying in such a remote area remains a mystery. Northern Centralia composed of the extension of “The Spine” mountain range and connect to Monta Occidenta to the east by a span of gentle hills and valleys known as the Lowlands. Humid winds from the Sea of Worms brings warmer temperature to this part of Centralia. While Siciani Monta Traders have been know to traverse through The Lowlands to Freyan, few settlements have been established along the narrow trade route. The trees that grew in Northern part of Centralia were all white with deep purple leaves. The wood decays almost as soon the trees were chopped down, spring waters that runs from the mountain top are plasmatic green but otherwise drinkable, and the land itself is constantly shroud in a hazy white mist. Nothing else grows in the soil of this land. Besides the haunting ashen white trees, the place itself is completely devoid of life. The Centralia side of Mount Ygasuya seems to have been blasted off by a force of cataclysmic proportion in some time past. What used to be a sloping mountainside is now a sheer cliff with ten thousand meter drop to the sandy gray desert below. There seems to be ancient architecture on the cliff surface as if a city has been buried and the cut up into cross sections, which falls into pieces onto the ridges of the cliffs. From a distant, it seems that the cityscape could extend into a cavern deep into the heart of the mountain. However the unscalable walls of the cliff, along with the constant winds around Mount Ygasuya made it impossible to explore these ancient mysterious ruins. A skyway bridge spanned straight from the Portal to the supposed location of gateless capital of Shárizaa, running borderline to the Costal Circle. Numerous Ancient Ruins dotted the pathway including the infamous “City of Glass”. A crater exist now at the centre of this once spanning metropolis, while the stone buildings in the city melted like candle wax and covered with a glazing of glass. Occasional ruins and strange technological wonders appears along the forsaken skyway bridge, scattered randomly by the constant shifting of ash sand dunes as if ancient stoneworks were bobbling on shifty waters. Temperature dropped below freezing at night with the frequent falling of black snow, while the temperature became unbearably hot during daytime. The distant silhouette of the portal, combined with the mirage effect of the grey sands created and illusion of a distant dark tower at the horizon, always overlooking the landscape but never reachable. The few that had follow the skyway bridge (also know as ‘the path of the beam’) said that the bridge lead them to a vast fortress just outside of the incongruous Portal. The ancient yet still formable walls of the fortress, with its army of giant automation, stood as the last bastion of what could potentially come out of the eerie but dominant portal. The Narrow strip of land between the nameless grey desert, and the lowland remains the only hospitable place in Centralia. Scattered small farming borough collectively known as “The Calla” resides in pockets of irrigable land. While the people of Calla had scavenged some of the machinery in the surrounding area for their own purpose, they claim their ancestors had lived in this place and maintained the same way of life since the dawn time. They have no memory or tales of the people that created these wonderful machines. Strangely enough, they’ve shared similar tradition and myths with cultures that are found in the outside world including the reverence of ‘Patzer, Lord of Maps’ as well as their own version of stories involving A Paint Wizard that shared similar trait with the apocryphal ‘Camoninja’. According to the villagers that lives within the Calla, once in few generations, a swarm of faceless men would come out of the mountains to wreck havoc upon their villages. Villagers would send their children (often twins) to them as offering instead so the rest of the village can live in peace. Children that was ‘offered’ that way would return mute, dumb and infertile , but as long as that tradition was kept there was peace. Djehutynakht wrote: This map looks exciting. I want to go on an adventure to it. We could start another thread with that purpose in mind... D&D 3.5/Rift/or Freestyle? Last edited by Nylonathatep on Sun Nov 17, 2013 1:11 am UTC, edited 2 times in total. Djehutynakht wrote: Yeah, Patzer is pretty good at map-keeping. thank you. I have had a lot of experience with maps. I think it'd be a great world for role playing but there's so much potential for wider interactions that I'd really like to do something like we did back in Fantasy Countries. we could also run both at once, have one for the overarching international game while another runs through a more localized, traditional role playing game. would anyone be interested in that sort of thing? A new country doesn't just form out of nothing: New DAXSEW HAD to have come from somewhere. Yes, that place is here: Old DAXSEW. It's just a skip across the pond from NDAX. The Quantum Republic of Atlantis is a very mysterious place: it appears and disappears randomly. It is only visible for a few days every month, the rest of the time it is simply open sea. Time appears to pass very slowly in Atlantis, but it is not known why the islands vanish. Its inhabitants seem to live a simple life and get most of their food from fishing. The Kingdom of Timatania is a moderate sized land known for its peaceful ways and relaxed lifestyle. The Timitanians are ruled by a monarch who enjoys in keeping things peaceful and happy and avoids butting into things when he can, and a Senate elected of people who more often than not simply enjoy the thrill of legislating and at the end of the day want nothing more than to compromise and keep everything nice and smooth. Granted, Timitanians are often similar and in agreement, but when they're not their leaders often search for an agreeable solution. The land of Timitania is usually agreeable in both temperature and climate. Although it sometimes gets a bit cold, people are able to deal with it. Food is usually plentiful and often delicious. Technology is embraced where useful or enjoyable. The people often live to ripe old age, and are amicable. The land is lush, and covered mostly in gentle plains and forests. Children are educated well by necessity, and those who desire more education in certain areas pursue it. The people do the work they need and like and otherwise spend much time in leisure. Basically, it's a very free and somewhat paradisiacal. However, there are always problems, namely defense from the rest of the world who cannot or do not share this lifestyle, and seek to conquer the land for it's richness. The northern border is essentially the top of a very high cliff the entire length, leading to a natural deterrent to whatever comes from below. That which tries to climb the cliffs is met with a barrage from above, be it a net or a landslide, and part of the cliffs are set with hidden traps. The other borders are defended by a very dedicated military that is called when needed and a very supportive population. There is a river, which originates from an underground source somewhere in the middle of Timantia. Half flows east, crossing the border to Kallipolis and into the sea, and the other half goes northwest until it plunges over the cliffs in in a great waterfall. Outsiders are welcomed, provided they embrace the local ethos of peace. Most do, and sincerely kind traders benefit the most at these ports. Those who do not are usually kindly asked to leave, and are sent with supplies to help them do so. Timantians usually stay out of world affairs, though some try to help those in danger when they possibly can. The King wonders often about why people have to squabble over these things, and why everyone can't just get along so we can get to deciding matters like what to eat for lunch and how to develop multiicolor roses. Lagoon à la Tropicano composed of mainly eight large islands in the centre region of the Archipelago: Tyees, San Guan, Isle Incognita, St. Milo, Ui Coras, Ante-llia, Marajo, and Hvítrmanna. (Currently parts of Marajo and Hvítrmannaand were partly occupied by Star-King Empire). The Ninth island, Mitsukejima, had been peacefully annexed and occupied by Vinagrato. Also many other smaller island exist between these islands, some as small as a house while others occupied by small city ports. The landscape here is a serene paradise, often exotic and untouched by civilization with white sandy beaches and clear crystal waters. Yet the shallow waters and rocky reefs are deadly to those that have no local knowledge of the area. Larger ships have been known to be stranded in sand barges or sunk by hidden reefs in these unsuspecting waters. Occasional Ruins dotted the Island region, and some could even be found under the clear transparent waters in the lagoon. Seafarers would spoke of Pyramids, walls and roads underneath the waves rich with treasures unimaginable. Archaeologist studying these ruins concluded that there was a culture named R'lyehians living in the area in ancient time when the surrounding region was still one landmass until seismic activity shattered the region and sunk its civilization into the waves. Their culture was advanced in mathematics and predominated by the worship of their dark tentacled Gods. Not much else is known about the R'leyhians. At first glance, the area itself is poor and savage. The Indigenous people of the region survives mostly on farming and fisheries. Tropical fruits such as Coconuts, Avocado, Papaya, Pineapple, Bananas, Mangos, Oranges, and Key Lime thrives in the region. The area is also known for its production of Rum and Tobacco. Larger cities usually located itself in alcoves and bays, serves as ports to harbour Ships from unpredictable and often violent tropical storms known to this area. In truth, the area is made wealthy by being a haven for illegal activities; it's market sold every kinds of contra-bands, drugs, slaves, and weapons imaginable. No place could rival its lawlessness; the peace was only kept by powers behind the trade that only maintain order when it benefits their illegal activities. Lagoon à la Tropicano is a key sea trade route between the vast region of the land, and as such it also became infested with acts of piracy. Often ships entering this region would hire "guides" to navigate the waters of these archipelago as well as protection against piracy. Even military ships have been known to be held hostage and ransomed by these daring Pirates. There is no unified government within this lawless region; Instead each cities is under its own ruler, "El Presidente", often under harsh dictatorship and complete totalitarianism. They often turn a blind eye to the tidings of underworld or even benefit from it. Overthrowing of a city's dictator and replacing it with an almost equal Usurper is the daily lives of the People in Lagoon à la Tropicano. Indeed, local politics was just part of the overall stratagem as seen by the powers struggle behind whoever was in control. No single person was certain who's maneuver and who benefited under these constant intrigues. Lagoon à la Tropicano is under the constant influence of its neighbours. The rule of one city would play sides between the external powers of Vinagrato, Cyrusia, Turaryark Kingdoms, Star-King Empire and other cities within the region. In truth, the people of Lagoon à la Tropicano would prefere to be left alone, but without a unifying government, geo-political influence, or military might, "El Presidentes" would often relies on outside powers for their own protection, only to switch sides when it suits them. In ages past, the then newly contacted Vinagrato had sent a mighty armada to occupy Lagoon à la Tropicano. A Typhoon known famously as 'The Divine Wind" wiped out most of the seemingly invincible fleet and the Northern City Ports rallied together to defeat the rest of it on the bloody "Battle of San Guan Harbour". Lagoon à la Tropicano enjoyed a century of relative peace until the recent land claim of The Star-King Empire which alarms the scattered city-states of Lagoon à la Tropicano. Seemingly powerless to counter their claim, they people inside the "Star-King" region resort to attrition to undermine the rules of these foreign power and destabilize the government of the region. Trade ships bearing the Star-King's Flag were targeted by raids while Island under the Star King's rule were often blockaded. Key members of Star King Empire were targeted by assassinations. The Locals often refuses to aid Star-King Empire's Troops sent to the region and they were often hit by acts of terrorism. Other cities within Lagoon à la Tropicano cut ties and withdrew support for the Star-King Empire and seek to politically isolate them. It seems that the underlying power are finally united in action against what they see as a threat to the stability of this region. A bit too close for my original intentions... but I'll live with it. And now I'm scheming up a new plan to take place (which I'll add too next time I'm back to my native computer). Djehutynakht wrote: A bit too close for my original intentions... but I'll live with it. And now I'm scheming up a new plan to take place (which I'll add too next time I'm back to my native computer). If you don't want it that close, feel free to move it further away. From adversity breeds opportunity. I'll go with this plan. To the East of Corona lies a sister and adversary nation known by the name of Virga (As Corona is latin for Crown, Virga is a word for staff, or scepter). Virga comprises the eastern half of what was once the island shared with Corona as well as what was once the series of peninsulae very near to the island's eastern shores (this will be explained below). While never graced with the large coal deposits of its Western neighbor (although a few exist in the west for domestic use) it hosts a decent array of resources to fuel the country's use and trade. Metalwork near the mountains in the center-west of the Once-Island (as people have begun to refer to it) is famed, and shipbuilding near the Once-Peninsulae in the East was known for speed, maneuverability and strength. The general stereotype was that the Coronians were always a bit more refined, a bit richer, while Virgots were slightly more tough and perhaps a sliver more powerful. In the past, Virgots would compete for passage between the southern sea and the northern ocean along with the Sicanta and Coronians. They had shared control over the Western pass, while Virga had control over the Eastern pass. It's true that the eastern sea of the Virgots was stranger and more difficult than that of the one bordered by the Coronians and the Sicani. While theirs was a peaceful oval bordered by smooth lands and dots of islands, the Virgot's sea was some labyrinth of the sea gods, twisted, morphed and dotted with all kinds of peninsulae, islands, cliffs, fjords, coves, lagoons, straights passages and bars of jagged rocks. The development of such swift and maneuverable ships by the Virgots directly came out of a necessity to be able to survive and master this difficult marine terrain. However, for ships passing from north to south, a decently navigable path ran in a roughly straight line from the northwest to the southeast. Using this, seafarers could safefly pass by this labyrinth without having to overcome all of it's difficulties, making detours to trading towns on the peninsulae and islands while they were there to barter goods, making the Virgots traders a decent livelihood. However, everything changed some several years back, when the onset of an earthquake would dramatically alter the region as they knew it. The onset of the earthquake, besides making the seascape in the middle sea even more difficult, completely connected the two northernmost peninsulae and very nearly did so to the south, cutting off the northern passage and narrowing the southern one severely. The people of Virga have been frantically trying to dig away the new earth and restore the old passages once more but, unfortunately, reuniting the seas has proven a very difficult challenge and it is taking them many years to restore the connections. Due to to this catastrophic event the people of Virga have now made a new and unlikely ally...in the Sicani. In years past, the Sicani as well as the Coronians were rivals of the Virgots in competing with passage from north to south. However, with their own needs to go around the Once-Island still existant, the Virgots have allied with the Sicani in order to secure use of the passage under the Sicani's graces. For the Sicani this gives them a useful deterrant to Coronian power and the disputes over their bordering islands. For the Virgots, while any years of actual military conflict may be gone on the Once-Island, the Coronians remain one of their biggest adversaries. To this day it is the deepest desire of Virgots of both sides of the sea to make the Once-Island a true island again and secure their sea-pass once more. Yggdrasil, The World Tree. (South of Corona), In green. 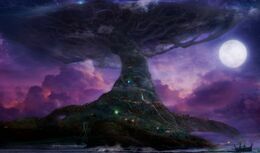 Yggdrasil, An Ancient Tree seemingly growing onto of an Isolated Island in the World Sea South of Corona, was perhaps the last wonder of the world left in the Age of Dawning. It was home to the Averial Elves, born with wings that allow them to fly as well as celestial beauty. The Averial Elves had lived in this tree in their whole entire existence, keeping to themselves mostly and practice non-interference to the tidings and events of the world outside. The Averial Elves cherish their simple lives and Yggdrasil is paradise to them. The tree shelters and provides all they'll every need. They have no needs of the rest of the world, and in turn hardly few outsiders are welcomed. The Tree itself is divided into layers and each branch can house an entire city of Averial Elves. The main branches are used for major avenues and houses important buildings while smaller and more distant section of the branches serves as suburbs. Reservoirs are created to store water while the Elves cultivate mosses as food and giant insects as beast of burden. Their houses are built like treehouses with small rooms often scattered upon sections of a branch connected often without bridges and ladders. Instead occupants flew from one treehouse to another. Larger buildings are like bee hives supporting itself upon the giant trunk of the tree. While twigs of Yggdrasil itself was often used as building material, carving into the World Tree is the gravest sin anyone can commit amongst the Averial Elves. Most of Averial Elves Agricultural production takes places at the trunk of the tree: The elves would plant fungus and moss onto the World Tree's barks and as the season turns it will grow into food that'll sustain the elves. Huge Roots covered the island forming large caves that serves as harbour at the base of the large tree, developed into what was known as the The Lower city at the North-Eastern bases of Yggdrasil. A great number of Fishing boats would venture in the nearby waters for their catch to supplement the Averial Elves' diet. Rarely a trader ship would stop and restock on its long journey from Nasyuht, Caspasia or Cyrusia towards Corona or Vigra. Here traders would also seek one rare commodity: silk. Only the Averial Elves knows the secret of creating such smooth and yet light material. Almost all clothing worn by the Averial Elves are made of silk of various qualities, but rarely does the Averial Elves export their fine textile. They simply wanted nothing from the world outside of their wondrous tree. Bayous covered the Western bases of Yggdrasil. It is the only part where land was visible, but still the area was covered in constant fog. Giant Mushrooms dotted the swampy area. To the south was full of rocky reefs that was known for a breeding grown of lobster as well as other foods such as clams and mussels. The Averial Elves do have a few smaller villagers in the area, making dwellings on the side of tall rocks that stood out from shallow rocky waters in the area. The Crown of Yggdrasil is where most Averial Elves resides, as well as being the centre of activity of the Averial Elves. Giant Spiders have woven a magical enchanted web around the perimeter of the city serving as walls. In the heart of the city itself resides the Queen of the Averial Elves, her beautiful outshine even the most beautiful Averial Elf. It seems that she was immortal, living ever since the beginning of Averial Elves' history. It has been said that Yggdrasil and the Averial Elves as a race was threaten only twice; and during the last confrontation the World Tree was almost burned down and the Queen herself had sustained a wound that scarred her once flawless beauty. The queen that was once endearing and loved by her people had became recluse and shied from her subject's eyes. Last edited by Nylonathatep on Fri Nov 29, 2013 4:56 pm UTC, edited 1 time in total. Yôlindo is a union of six small fishing towns on the southern coast of Shári. While they managed to break free from Shári rule during the decline of the empire, their very small land area did not allow much room for agriculture in this newly independent country. So the Yôlindans sailed to the south and founded some settlements on the coast of the southern continent, for farming purposes, to be free from overpopulation, and to engage in trading with the local tribal people. Hnfahdlkj is a large island southeast of the mainland, surrounded by hundred-meter-tall vertical cliffs. The entire island consists of fertile farmland, but below ground there are enormous deposits of various metals, most notably copper and iron. The inhabitants of Hnfahdlkj are known for their intelligence, their religious devotion, their dislike of outsiders, and their language which no one else can pronounce because of its minimal use of vowels (many suspect there is a connection between the unpronounceability of their language and their dislike of outsiders, but no one can agree on which is the cause and which is the effect). The people of Hnfahdlkj are vegetarians and sustain themselves by farming; however, due to their technological advances, only a small minority of the people need to serve as farmers, while most of the others are scientists, engineers, philosophers, or monks. They are generally a peaceful people; although they have a substantial number of highly advanced weapons, none of them have ever been used, since no one has yet been foolish enough to attempt to invade their land. Hnfahdlkj has no form of currency; due to their religious beliefs, all the inhabitants feel obligated to make sure none of their people are in want, and the vast majority consider it not merely an obligation but a privilege to serve their fellow men, so they have no need of money. Ever since they discovered that there were other countries beyond their borders occupied by intelligent members of other species, their monks and philosophers have debated whether members of other species can validly receive the initiation rites of their religion; the vast majority feel that such rites are necessarily restricted to their species, but there has yet to be an official decision on the subject. It is likely that a change in opinion on this question would result in a greater openness to interacting with outsiders, although that is not certain. Blúerídge is a state of mountain people, located just north of Daxsew. It is a heavily forested country, and the people mostly live in log cabins. They are suspicious of foreigners, but open to trade. Winters are very harsh in Blueridge, with deep snow cover for almost half of the year. Apparently the oceans east of the large continents have been given the convenient names of: Northern Ocean, Southern Sea, and Southern Ocean. Ivalia is an uninhabited island in the middle of the Southern Sea. Although the island is rich of natural resources and abundant with forests and wildlife, most peoples of the world are not aware of its existence. This is probably due to the fierce storms in the waters around the island. The island only appears on the oldest maps of the Averial Elves. The land of Puntz is located mainly on a peninsula jutting out to the east of Virga. The people of Puntz are very simple and straightforward people, with a kind but straight-talking demeanor and basic humor. Their government is a direct democracy, where the people come together several times a year in an empty field to propose and vote on matters. Otherwise, the affairs of state are headed by four elected individuals called The Fourmen, of which one is selected as Chief Fourman. Life in Puntz is generally agricultural. The majority of the land is comprised of either herding (chiefly sheep) or farming (chiefly potatoes and cabbage). There is a small class of merchants and traders at the tip of the peninsula, centered around the town of Puntzport (like I said--simple people). The good life for Puntzians is generally envisioned as life in a cottage overlooking the peaceful marshlands on the sea-coast. The chief holiday is Happ Morgo Day, centered around the folk hero Happ Morgo, a jolly young man said to live in a blue cottage by the sea, chewing onions all day with his pet mule Nizzy, who nibbles on the seagrass and has a yellow stripe on her ear. It is said that preceding Happ Morgo Day, Happ and Nizzy travel around Puntz bringing good fortune to the people. Around Happ Morgo day it's common to eat the national dish, called Puntschnitz, comprised of sheep, boiled cabbage, and potatoes, often salted and buttered. However, this is also a point of contention between the people of the north, and those in the very south around Puntzport. In the north, it's customary for Puntschnitz to be served from a stick, like a giant kebob. However, around Puntzport it's primarily served in the form of a stew. Both sides are very defensive about their form of the dish. It's not unusual for simple farmers and townsfolk, if knowledgeable about absolutely nothing else, to be able to recite with almost academic style the rationale, tradition and merits of their particular form of Puntschnitz. Nonetheless, the most common form of debate on the subject between the two sides tends to be a burp followed by a barrage of slurred shouting back and forth at a local tavern. Avarija is a very boring country. Not many people would have heard of it, except for the fact that it produces 50% of the world's potatoes. Potatoes are the main staple of its economy, for they grow very well in Avarija's soil; the country is otherwise fairly poor. The Midrean Kingdom is located on a somewhat sparse peninsula and archipelago to the north of Avariga. Much is rocky or pastoral, although there are some more lush woodland in the interior back toward the mainland. The Midrean Kingdom is best known for a long-running political dispute known as the Feuding Royals. Namely, everyone in the Kingdom claims to be King. Or at least close royalty. The Midrean Kingdom was founded several generations back when an eccentric merchant, Midras, arrived by ship from a foreign land and staked his property as the realm's present-day boundaries. With him, Midras brought his twenty-four wives and six husbands. Originally, Midras simply styled himself the landowner of this otherwise unclaimed piece of territory, and with his family built a sizeable ranch to oversee it. However, Midras' had a flair for eccentricity and self-importance. After a heated dispute with fishermen he perceived to be trespassing in his waters, he declared himself King and had the fishermen dragged into his 'court' for royal punishment (30 smacks each using the fish they'd caught, by tradition). Following his declaration of royalty, Midras subsequently crowned all of his wives Queen and his husbands Prince. He then went about building his kingdom, in more ways than one. First, physically. Midras wanted all the trappings of Kingliness. He ordered for himself nice robes, a gold crown, a scepter and all such things. For his 30 consorts, wooden crowns leafed with gold. He also had a castle built, on a cliff overlooking the waterfront near the ranch. Midras' Castle is amateurish and small by world standards, yet it, along with the True Golden Crown, have become the chief objects of contention amongst the Feuding Royals, as they represent the most valid claim to complete authority. In addition to his castle and royal stuff, Midras also built his kingdom's population... personally. By the time of his death, King Midras had produced around 85 heirs. This is from where the problem of the Midrean Kingdom stems. Midras and his consorts came from a land where it was customary to marry once and have no more than two children (hence why he was considered an eccentric and an outcast). If a family did have two children they usually inherited equally. So when Midras died, nobody knew what to do. Every child was, by tradition, Midras' full heir. But there was only one castle, one throne, one true crown and scepter. Thus every one of Midras' children declared themselves King or Queen. Since then they, and their descendants, have all jockeyed for the throne. For successive generations different branches have fought both amongst themselves and with other branches to establish dominance--capturing land, building their own castles and settlements, and declaring successively their own rule. It's not really particularly violent--everyone else is family, of course. Foreigners are brought in as spouses (more than once disappointed to discover that the Prince or Princess they married didn't actually have much power at all), but otherwise the Feuding Royals is a strictly family affair. Everyone in the Midrean Kingdom is descended directly from King Midras. The most valid claim to power is control of Midras' Castle, and possession of his true-gold crown and scepter. This is... elusive, and rarely does anyone achieve this for any significant length of time. In truth, many foreign observers doubt that the branches of the family will ever cede power to any of the others. However, there was some progress in the Primogeniture Renaissance. Eventually having every Midrean-born individual claim kingship was getting too cumbersome, so some of the imported spouses introduced the idea of Primogeniture. Nobody would agree to implement it retroactively, of course, and put an end to the conflict (besides, there would be too much controversy over who's the true eldest child of which wife or etc.). But now, at least, not everyone claims to personally be the King. However, everyone demands to be at least a close relation. Once a branch starts getting too big, some of the family members will undoubtedly rebel and declare their own heir, as primogeniture is certainly a loose concept at best. The second-best claim to power is one of the original gold-leaf wooden crowns. Whoever has one of the wooden crowns is generally considered one of the branches in the lead (minding that there are 29 slots for this honor*). These crowns also are the inspiration for the standards of the different branches. Some time in, the different branches realized that all of them using Midras' Coat of Arms was... confusing. So they started to differentiate. On each crown is a unique emblem that King Midras decided on when commissioning them. For instance, one of his wives who was a particularly good baker had a baking symbol on her crown. One of his husbands was a particularly good carpenter, and so had a carpentry symbol on his crown. Such symbols were then integrated with Midras' standard to make identification a bit easier (as additional sub-branches broke off, they simply added initials to the standards). Today only 29 branches of the family compete in the Feuding Royals. Midras' middle son staked his claim as King with the others, but was honestly never quite interested. His branch of the family pursued their royal claim with the least fervor of any of the branches. Finally, he and his children (and a few grandchildren) just up and left, sailing away. it is said that he was prosperous in the country he sailed to, and that his descendants to this day are still prominent and powerful members of the society there. But in the Midrean Kingdom that branch is generally looked down upon as the black sheep, and no mention of their accomplishments are made. Reviving this was a great idea and I applaud you. The Republic of Layfuld is not a republic at all, but is rather clearly a puppet state controlled by Virga. The previous minister of the state signed over the rights of managing the country after being offered a hefty sum by Virga, aiming to get this land to promote using their channel for trade before it became unusable. As such, most of their budget goes towards developing the land around their strait, turning the twin cities of Morta (north of the strait) and Beurta (south) into megapopulous cities. This unfortunately leads to most of the rest of the country falling to ruin, as hardly any town can maintenance the roads on the shoe-string budget they receive. The twin cities, being so valuable to traders, previously came at a cost, but not always a monetary one. Instead, the local administration kept track of all ships passing through, and made sure that all who were going west and then to the southern sea signed an agreement if they were not going to pay the usual frustratingly large tax. This agreement stated that a trader will be given tax-free passage through the Layfuld strait, so long as they showed up in the pass of Virga in 2 weeks. Any more and they could be presumed to have headed through the competing strait and are totally barred from ever making passage again. Ałendielle is a nation of many species of sentient snakes, resident in both the land and sea. It is very welcoming to strangers, but almost no one visits because of its reputation, and the fact that most of the snakes have highly poisonous venom (despite never using it). Due to Ałendielle's isolation, it remains a place shrouded in mystery for residents of the eastern continents. The famous warbling "sea song" of the snakes can cure illness and induce euphoria, but only if it truly appreciated. If the listener does not truly wish to hear the song, it has fatal results. The few visitors who wish to appreciate the culture of Ałendielle tend to be so enchanted by the place that they never want to leave, and spend the rest of their lives gradually becoming more snake-like, mastering age-old snake arts such as telekinesis, telepathy, and psychic group meditation. It's rumored that if any person spends long enough around snakes, eventually they will become a snake themself. Trucito, named after the word for "serenity" in its official language, is a small state centered around a very specific market - the export of Layfuldi rielt meat. This very specific subspecies of rielt (a creature that resembles a dolphin) can be found in many places, but it is only in heavy abundance in and around the Bay of Layfuld, which they mainly occupy. Trucito was originally an unorganized group of aborigines who were at one point held totally under the control of Layfuld, hence why the bay is named after Layfuld and not them. Under this oppression, the Truciton people organized into rebellious towns and more recently revolted, along with the partial help of other nations around. The minister of Layfuld ceded the land to the Truciton, allowing them to become their own industrialized modern country. This is when they named themselves Trucito, after the fact that the sea's really calm and nice. 1. Patzer just upped the ante to a whole new level with that westward expansion. 2. Relatedly, Adam H's southern continent, if I recall, was supposed to basically extend infinitely south and westward for the purposes of the map. I assume we're just gonna throw that out the window and shape the rest of that landmass in due time? (people have already stolen pieces of the gray anyways). The Ingramid Empire ("In-grah-mid") spans a large swath of land covering the region known as the Mid-Weiddland. Bordered by a mountain range to the north and the sea to the south, Mid-Weiddland was an expansive, bountiful area filled with thick forests and wide fields. it's rivers ran strong and clean and the soil was rich. Minerals and ores could be found throughout the land, especially in the north, and timber was plenty. Its natural resources were abundant for the use of the native peoples. The climate was fair; snowy winters, hot summers, temperate in-between seasons, all of about equal length. Mid-Wieddlanders have always shared a common culture. They're similar in appearance and ancestry. They share a common language--Weiddish. Common customs, holidays, values, religions. There are minor variations of course, such as local dialects. But travelling from one extreme end of the region to the other, one could see that these people obviously have much in common. However, for the uniformity in culture, the political situation had always been turbulent and changing. Throughout history, Mid-Weiddland had been divided into a great number of kingdoms, principalities autonomous republics, and other holdings--occasionally by outside kingdoms. These borders had shifted often through history--sometimes a powerful king would consolidate several small states into something bigger. Sometimes a holding would crumble and dissolve into numerous micro-entities. While the culture of Weiddland stayed the same, its internal borders shifted. No entity ever managed to unite more than a quarter of the territory, and there were always a great number of states. Several centuries back, however, marked a sea-change in Mid-Weiddland history. The region began to open up more to the world. Powerful entities were exerting their influences. Some held Mid-Weiddland territory and others obtained favorable treaties. More than one of the leaders of the Mid-Weiddish states were played against each other. Thus many of the the princes convened together and made a historic decision. Mid-Weiddland had to be united. A single entity that could stand stronger against the outside. However, while the princes wanted to protect against the exterior, none wanted to compromise their own authority internally. Each prince was wary of the others. None wanted to risk one from amongst them gaining too much power over the others. The princes appointed as a figurehead leader the Dowager Lady Ingram. Lady Ingram was the widow of the late Prince Uller of Lower Oshbagon. She was considerably younger than the late Prince, though they had shared a mutual respect and affection. She was well educated, and was regarded as a scholar. Lower Oshbagon was the smallest principality in Mid-Weiddland. Located in the center of the region (marked with a gold cross on the map), south of the mighty Oshbagon River, it was largely isolated from outside influence. The Princes considered her a perfect choice. She would be respected both across Mid-Weiddland and abroad. She would be an efficient manager of whatever tasks the Princes laid upon her. However, being the Dowager of a weak principality with no heir, the Princes believed that Lady Ingram's influence and ability would be limited. They would be free to handle the affairs of their own principalities as they pleased. However, the Princes drastically underestimated the abilities of the sharp Lady Ingram. From the moment of her appointment, the Princess set into motion subtle plans to increase her influence and power across Mid-Wieddland. Steadily, she gained ground against the princes, quietly so that they did not notice and react. She enacted commonsense reforms within her powers, earning her praise and admiration from the common folk. She was regarded as wise, decisive, charismatic, and benevolent. Her advances against the princes were slow at first, and then became more pronounced. She never sought to officially remove them from power or curb their privileges, which helped smooth the process. But as she became more powerful her moves became more pronounced. She was now regarded by even the princes as a true leader. This sentiment was reinforced when Ingram began to undertake military campaigns. Although most princes had joined in union under her, there were still several rogue states as well as parts of Mid-Weiddland that were controlled by foreign powers. Lady Ingram chose good generals and built a strong national military. Some areas willingly joined her. For the rest, she initiated a series of military campaigns that were more or less a resounding success. Lady Ingram was able to unite most of what was considered Mid-Weiddland, and with that her place as ruler was solidified. She was with great fanfare crowned the Empress Ingram in the city of Oshbagon (the seat of what was formerly called Lower Oshbagon, now with the appellate "lower" dropped), which was growing into a great capital. The Empress, Lady Ingram was, as mentioned, a great scholar. Under her reign she championed universities, libraries, the sciences and the arts. This would play into the future of the new nation's government. The Ullerian Court proved to be a magnificent success. For centuries it has picked successive rulers of the Ingramid Empire. Evaluations are not simply based on scholarship but on a wide number of qualities that make one the best leader--sometimes simply intuitively sensed by the reigning regent. The rulers selected from the court have more or less kept the Empire going strong. Those students who were not chosen as emperor usually went on to fill important government positions in service to their elevated peer. The Ingramid Empire has not tried to expand beyond its borders, and still rules over the same 34 principalities and republics of Mid-Weiddland that Ingram herself united. The tomb of Ingrid and Uller outside Oshbagon is to this day considered to be a great wonder of the region. No, no, the passage to the southern sea I was referring to was westward, through the passage of Corona and Sicanta. There's definitely an open passage there, unless someone wants to build a sudden landbridge somewhere. Now, I hope this isn't ruining the idea of Ałendielle too hard! Schenmast was a penal colony established by Coaszen. After a couple centuries of constant attacks from the Eínsrach, the state decided that devoting so much of its industry to creating prisons and penitentiaries for these people was putting a drain on the development of the rest of its public services. Besides, they were ruining the nice landscape created by the scenic farmlands and rivers. So, after locating a suitable, noncolonized area that was more or less isolated from any other living being, Coaszen began dropping new prisoners off at the east side of the colony to almost fend for themselves, given sparse food and tools every now and then. This worked well for a few years, until Coaszen realized the east side of Schenmast was actually fairly habitable, and they could get a pretty penny working that land in addition to their homeland. So, they set about corralling every Eínsmann prisoner to the west side of the mountain range to restart the life they had just worked on recreating on the east side. After most of them were across, entrepreneurs were given cheap one-way trips to the archipelago to begin fishing and farming new and exciting goods. Since then, Schenmast has been peacefully given its independence from Coaszen, under the condition that they continue to keep taking in prisoners whenever their jails got too full. The governors of Schenmast still act as if they weren't independent though, focusing trade on only Coaszen and nearby states. The scholars of Schenmast (admittedly there aren't too many) still do not know what lies beyond the north and south border, but as of now, they do not care to explore. This entire footnote on the map is almost all uncharted territory, bar the path of ocean they took to get here. Who knows what dangerous fiends lurk around the corner? Something few Schenmasters are aware of is that, during the Western Penal Shift, some Eínsmann were indeed left to the east. These Eínsmann flawlessly integrated into the then-Coaszen society, thus meaning that most of Schenmast today is half-Coaszen half-Eínsmann in ethnicity. In fact, one of the most celebrated men in its history, Arnit Saworistop, who single-handedly saved an entire town from starvation by giving most of his crops away, was originally an Eínsmann prisoner. The Kingdom of Efvšjitgajlija is a small nation to the east of Avarija. It had been traditionally part of Avarija, but with its own distinct identity, so some of the residents yearned for independence. Some minor Midrean prince ended up taking full advantage of this, supporting the rebels, and set up an independent kingdom there. As a result, neither the Avarijans nor the Midreans particularly like this new state, and thus it has developed close economic ties with the Ingramids.